Song tells the story of Merryn, a young girl who lives alone with her father after the death of her mother. Merryn wants to go sailing with him but is deemed to young, and so spends most of her days with domestic chores and reading library books. One day her father is lost at sea, and she embarks on a mission to find him. In the best fairy tale tradition, she meets various friends along the way, including a clockwork seahorse, a baby sea serpent she names Swish, and a merrow, or mermaid, named Cara; she also finds out more about her lost mother. 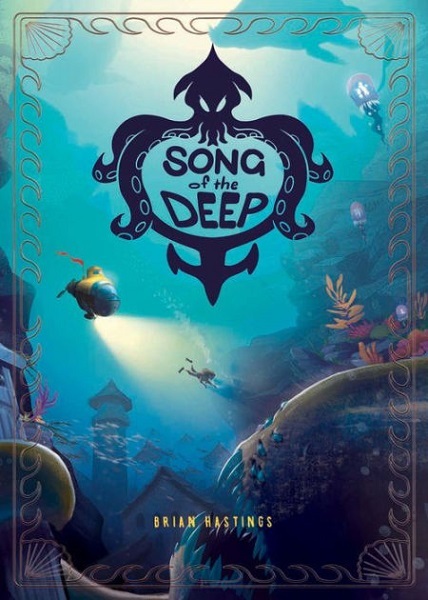 The locations on the map in the book are all visited, including the Glowkelp Forest, the Skeleton Reef, the Merrow Ruins, and the Forbidden City. Each of these locations is assuredly the setting from the video game, but they all feel organic to the story told here. Eventually Merryn finds her father and they return safely home, having made peace not only with her mother’s death, but with one another. This is the sort of information that generally appears in interviews about a book, rather than the book itself; that Hastings made a point of its inclusion underlines not just a pushback towards how girls—and women—are treated in media generally, but in genre and in video games as well. We need look back only at the recent (and still ongoing) Gamergate fracas to see the hostility displayed towards women in the video game industry. By making Merryn, a young, intelligent girl the hero of the journey, Hastings pushes back from within, and it’s a really wonderful change to the usual narrative of things. The worldbuilding of the story is also interesting, with some particular elements of note. The unnamed world here is not ours; Cara the merrow explains how human explorers came long ago, and were at first friendly with the natives, before they became greedy and destructive. The aftermath of war is revealed in the ruins of cities, the ecological destruction of the sea and its inhabitants (Merryn’s father only sometimes returns home with a catch), and the remaining war machinery that poses a danger to Merryn and her friends. It is also revealed that Merryn’s mother, Meara, once knew Cara and that they were likely separated because of the war. Cara may well be one of the last of her kind, though there is hope to be found in the eggs that she shows Merryn towards the end. Likewise hope can be found when Swish’s mother, a magnificent queen leviathan, appears and aids in the final rescue and return home. A healthy respect for the environment and all creatures is the way to survival, rather than destructive greed; this is a good moral and general, and one that seems more relevant to the real world everyday. Ultimately, this is a great book for young readers, whether or not they are girls, and is quite a bit of fun for older readers too. It is surprisingly thoughtful, and much of it will resonate long after the first reading. This sounds great! Thanks for reviewing a kids' book!